This interview with Mike and me appears in the January/February 2018 issue of “Texas Journey” Magazine, the publication of the Texas AAA. It encourages people to consider a visit to the Remembering Columbia Museum in Hemphill, Texas. Mike and I will be speaking there on February 1, 2018, the 15th anniversary of the Columbia accident. This is a follow-up to our post from July 22, 2017 (“Why Is the Book Taking So Long?“) in which we discussed how impatient we were all feeling about seeing the book in print. The great new is: the book has been printed! We received the first shipment yesterday. It’s being shipped to booksellers this week, and it will be on the shelves in early January. I took advantage of this happy event to recap what it took to bring this book to you. It’s just a brief snapshot of some of the milestones and hurdles that Mike and I as authors went through to put together a non-fiction book. (And many of my author friends have remarked about how FAST this book came about.) The milestones don’t take into account the hundreds of emails, scheduling the interviews, checking facts, handling administrative issues, etc. Oh yes, and sitting at the computer to try to write more than 1,000 words per day for a three-month period at the end of last year. This book has literally been my life for the past 981 days. Mike and I set off on this journey on April 9, 2015 at 12:40 pm at Crackerjacks in Titusville, Florida. Here’s a photo taken right after Mike brought up the idea of a book about his experiences in the Columbia recovery and reconstruction. And here’s Mike opening the first carton of printed books on December 15, 2017 at 1:00 pm. If you’re keeping track, that’s 2 years, 8 months, 6 days, and 20 minutes later. There aren’t words to convey how incredibly powerful this experience has been for me as an author. What an honor it has been to sit with people as they relived their experiences in what most of them called the most important thing they had ever done. Each person to whom I talked took a hero’s journey that ultimately resulted in contemplating his or her purpose on this planet. You don’t get any more real than that. There weren’t any casual spectators in this story. Everyone’s life was changed by the events of 2003 and their aftermath. My life was forever changed by researching and writing this book. I hope your life will be changed after you read the story. Mike and I can’t wait to hear how readers will respond to the book. We encourage you to send us your comments and if you feel so moved, to write a short review on our book page on amazon.com. You can also look for us on Goodreads. Author Jonathan WardPosted on December 16, 2017 Categories Book11 Comments on A Dream Realized! Mike and I were invited to speak at the Astronaut Scholarship Foundation’s “Space Rendezvous” in Cocoa Beach, Florida in November this year. Our presentation was entitled “Columbia Recovery and Reconstruction: An American Story of Courage, Compassion, and Commitment.” It was the first time Mike and I had jointly given a talk, and what an audience it was—ASF board members, at least a dozen astronauts, former NASA Administrator Mike Griffin, people who had worked on the Space Shuttle Program, and dozens of “civilians” for whom the space program forms an important part of their lives. Many of those present had flown on Columbia, supported her on the ground, or had been part of the search and recovery effort. Mike opened with an overview of Columbia’s STS-107 mission and the aftermath of the accident. He recounted his experiences on Landing Day, as he awaited Columbia‘s return, and the horrible feeling of profound emptiness he experienced when he realized Columbia was lost. Jonathan followed with a discussion of what the people in East Texas were experiencing at that same moment when Columbia‘s debris created a continuous cacophony of sonic booms and the wreckage began impacting the ground. Mike and Jonathan then talked about the mobilization efforts that began immediately after the accident, both at NASA and at the local level in Texas, and the overwhelming success of the recovery forces who worked for three months to find Columbia‘s debris in East Texas. Jean Wright, who worked as a seamstress on Columbia’s thermal protection blankets, shares a memory of Columbia. Mike described his experience in leading the reconstruction of Columbia at Kennedy Space Center. He also talked with pride about preservation of Columbia‘s debris and the ensuing lessons-learned program that has turned Columbia into a living laboratory about the effects of uncontrolled hypersonic reentry. 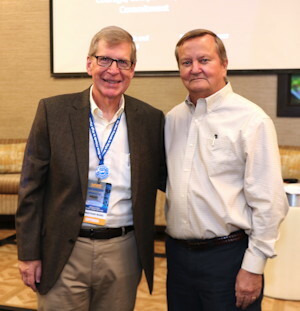 Former NASA Administrator Mike Griffin talks about the return to flight effort. Partially obscured behind Griffin is astronaut Jim Wetherbee, who led the search for Columbia’s crew. Throughout the presentation, Jonathan and Mike invited audience members to share their experiences. Astronaut Jim Wetherbee discussed his challenges in leading the daunting task of recovering the crew’s remains. Administrator Griffin spoke about correcting the issues and flaws uncovered by the Investigation Board and returning the shuttle to flight. Charlotte Leinbach (left), Mike, and Jonathan share a relaxing moment with ASF Board Member Carol Tyler on November 4. The Book Is Going to Press December 8! 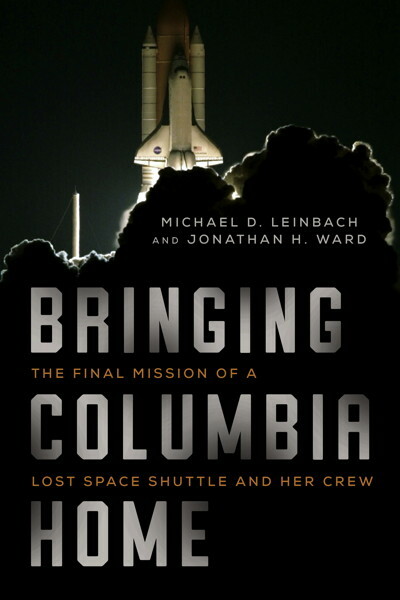 This is just a quick note to let everyone know that “Bringing Columbia Home” is going to press tomorrow! Mike and I began collaborating on this book in April 2015. On one hand, it feels like ages since we started this project. On the other hand, the time has flown by. We’ve met so many amazing folks along the way and heard so many incredible stories about how Columbia touched people’s lives. I can’t express enough how profoundly rewarding it has been to help bring the story of Columbia’s heroes to the attention of the broader public. Our publisher tells us that the book will be shipped to stores in late December. Despite the official release date of January 23, the book should start appearing on shelves in early January. Please be sure to check the Upcoming Events page of this website, where Mike and I will maintain our schedule of talks, book signings, and other public appearances. Thank you again for your interest and support along the way — and stay tuned! Author Jonathan WardPosted on December 7, 2017 December 7, 2017 Categories Book4 Comments on The Book Is Going to Press December 8!